Has Arctic sea ice returned to normal? Arctic sea ice has been steadily thinning, even in the last few years while the surface ice (eg - sea ice extent) increased slightly. Consequently, the total amount of Arctic sea ice in 2008 and 2009 are the lowest on record. When people talk about the state of Arctic sea ice, they most commonly refer to sea ice extent. This is the area of ocean where there is at least some sea ice (the most common cut-off is 15%). Sea ice extent shows a strong seasonal cycle as Arctic ice melts in the summer, reaching a minimum in September, then refreezes in the winter, peaking in March. Temperature is the main factor driving changes in sea ice extent, although other factors like wind patterns and cloudiness play a part. While sea ice extent has been steadily declining in recent decades, it fell to a record low in 2007 due to a combination of factors. 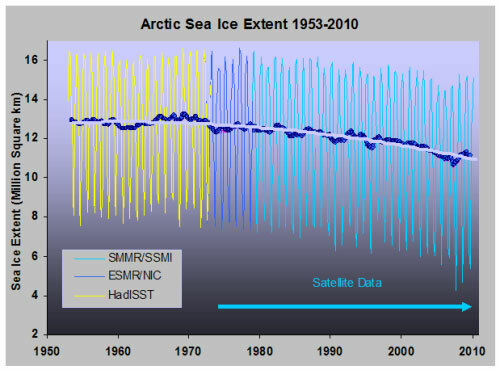 Figure 1: Sea ice extent with trend from 1953 onwards. Sea ice extent gives us a reasonable indication of the amount of Arctic sea ice but does have its limitations. Extent tells us about the state of the sea ice at the ocean's surface, not what's happening below. A better metric for the total amount of sea ice is, well, the actual total amount of sea ice, measured by sea ice volume. Satellite radar altimetry (Giles 2008) and satellite laser altimetry (Kwok 2009) find that Arctic sea ice has been thinning, even in 2008 and 2009 when sea ice extent showed a slight recovery from the 2007 minimum. So while some claimed Arctic sea ice was recovering after 2007, the total volume of Arctic Sea ice through 2008 and 2009 were the lowest on record (Maslowski 2010, Tschudi 2010). Figure 2: Continuously updated Arctic Sea Ice Volume Anomaly Polar Ice Center. Currently, websites such as Watts Up With That are using sea ice extent in 2010 to claim Arctic sea ice has returned back to normal. A few days ago, Watts claimed that we had "more ice than any time on this date for the past 8 years". On the contrary, in March 2010, the total Arctic sea ice volume was 20,300 km3 - the lowest March value for total sea ice volume over the 1979-2009 period. Those who claim Arctic sea ice has returned to normal are focussing at the thin shell at the top and neglecting the steadily thinning sea ice below.